Caitriona Walsh joined the New Seekers in 1979 as Kathy Ann Rae's replacement. Prior to joining the group, Caitriona had studied music for two years at University College, Dublin, qualifying in 1978 with a teaching diploma. On 4th February 1979 Caitriona took part in the competition to find Ireland's entry for Eurovision Song Contest. The final was held at the RTE television studios in Dublin and was hosted by Mike Murphy. Although her song, Superstar, finished only sixth out of eight entries, Caitriona was soon to be rewarded with solo success from another quarter. Artist / Song Points Pos. "I was devastated because I am a very religious person who went to Mass every day ... It wasn't just a gig for me, it was a very spiritual experience. For my mother it was the ultimate honour, that my voice would be the first thing the Pope heard when he landed in Ireland." "It ended up with the Pope coming down and no song being sung for him. I don't dwell on it now - ups and downs are part and parcel of this business - but I'll never forget it." 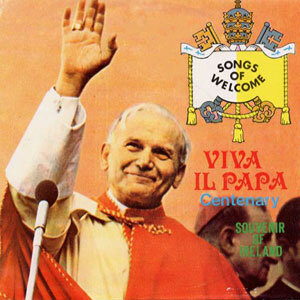 Viva Il Papa ended the year at number 11 on the Irish best sellers chart, one place ahead of the Boomtown Rats and higher than many of the top chart acts of the day - Blondie, Queen, the Village People and Abba. In 1980 Caitriona sang with Eurovision star Johnny Logan, recording backing vocals for him on a song called Hollywood. Nicola Kerr and Caitriona Walsh. In 1982 Caitriona starred in Noel Pearson's production of the Pirates Of Penzance in Dublin. Originally due for a four-month run, the production was extended for another four months and kept Caitriona busy for most of the year. The Irish Film Orchestra's clients include the BBC, Disney, Euro Disney, HBO, MGM, PBS, Universal and Radio City Music Hall. The Orchestra has played on many film soundtracks including: The Mask (1994), starring Jim Carrey and Cameron Diaz; Dancing At Lughnasa (1998), starring Meryl Streep and Michael Gambon; When The Sky Falls (2000); Disco Pigs (2001); The Good Thief (2002); Lassie (2005); Becoming Jane (2007), starring Anne Hathaway, James McAvoy, Julie Walters and Maggie Smith; and Love & Friendship (2016), starring Kate Beckinsale. The Orchestra has recorded with many well-known singers and stage performers, including: Michael Crawford, Siobhan Dillon, Brian Kennedy, Johnny Mathis, Katie Melua, Van Morrison, Daniel O'Donnell, Marti Pellow, Lisa Stansfield, Rebecca Storm, Shania Twain, Bonnie Tyler and Wet Wet Wet.